Force 10 (89-102kph), huge waves and the best storm sailors fighting an epic battle with nature – and each other – when the strongest storm of the winter hits the Northern Hemisphere. 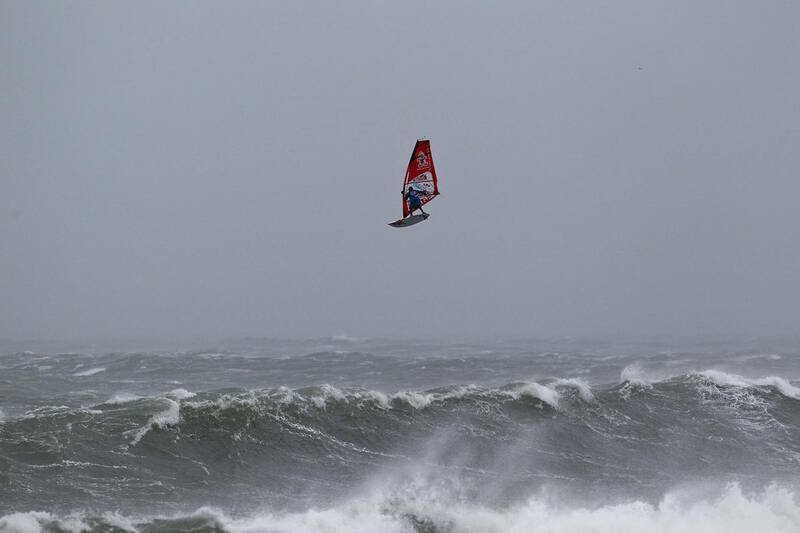 The most selective and challenging windsurfing contest in the world is gearing up again to find the winter’s heaviest surfable storm. The unique contest format means eight of the best windsurfers in the world will mobilise on short notice to chase a Force 10 storm, where they will battle it out to see who is truly the best storm windsurfer in the world. The expert judge’s panel – including Professional Windsurfing Association Head Judge Duncan Coombs – will look for jump height and trick difficulty, the most stylish wave rides, and timing-critical moves as the riders take advantage of over mast-high waves and up to 100kph winds. The four finalists from the last Red Bull Storm Chase — Leon Jamaer (JP / NeilPryde), Dany Bruch (Starboard / Flight Sails / AL360 / Shamal Sunglasses), Marcilio Browne (Goya Windsurfing / MFC), and winner Thomas Traversa (Tabou / GA Sails) — are automatically entered. Four open spots remain. Riders can apply at www.redbullstormchase.com and will have to submit a video and rider profile to be considered. Given the incredibly challenging nature of storm windsurfing and risks involved, only extremely qualified windsurfers over the age of 16 are encouraged to apply. The final selection is made by our panel of experts. As stated, the mobile and reactive nature of the contest means the location is yet unknown. However, priority will be given to locations that offer: a likely combination of Force 10 wind and waves; close proximity to an international airport, adequate medical coverage and emergency services, and an absolute guarantee of adequate water access. During the given weather window these conditions are most likely to form in the Northern Hemisphere. Full safety crews consisting of water sports and medical professionals will be onsite to assist in the event of an emergency. A ‘watch’ alert will go out approximately 120 hours before the event, and confirmation will come just 72 hours before the event, at which point, riders and event crews will travel to the selected location. Pre, during and post-event updates will be available online at Facebook.com/redbullstormchase.